A mysterious signal broadcast through cellphones turns most of the population into murderous savages. King's novel may have seemed relevant in 2006, but in 2016 it's a dated and tired premise. It doesn't help that, when you get right down to it, this is just another zombie movie, one that adds nothing to an overcrowded genre. There's a long-running gag in TV sitcom New Girl concerning Jake Johnson's character working on a zombie novel that never seems to near completion. As with cinema, tales of zombies have clogged up the horror shelves of bookstores for the past decade and a half, the go-to horror sub-genre for writers lacking imagination. One author you can't accuse of lacking imagination is Stephen King, so it was a surprise back in 2006 when he delivered a thinly-veiled zombie novel of his own in the form of his bestseller Cell. I can't speak for King's novel, but this decade-too-late screen adaptation does nothing to standout from the shambling herd. To its credit, Cell wastes no time in getting into the rotting meat of its tale, opening with a poorly staged massacre in an oddly under-populated Boston airport, prompted by a mysterious signal that turns cellphone users into murderous savages. Unaffected, thanks to his phone's battery dying just before the outbreak, is graphic novel artist Clay (John Cusack). Attempting to reunite with his estranged wife and son, who may or may not have been affected, Clay sets off on a journey accompanied by the aging Tom (Samuel L Jackson) and teenager Alice (Isabelle Fuhrman). With its commentary on our obsession with our phones, King's novel may have seemed relevant in 2006, but in 2016 it's a dated and tired premise. It doesn't help that, when you get right down to it, this is just another zombie movie, one that adds nothing to an overcrowded genre. It has become clichéd to suggest a movie might work better as a TV or Netflix series, but Cell attempts to pack so many vignettes into its mercifully brief running time that it could only be improved by the narrative expansion afforded by a six-part mini-series. Our not so merry band of protagonists run into several groups on their travels - headmaster Stacy Keach's school full of docile zombies; a bunch of dipsos holed up in a bar; a borderline psycho and his pregnant wife - and each encounter could easily stretch to a 45 minute episode. Here, we get no more than 10 minutes for each of these scenarios, which makes it all seem pointless, and removes any potential for drama. The best zombie movies confine themselves to a single location, usually out of budgetary necessity. Cell ignores this precedent, with its heroes constantly on the road, but while its budget is no doubt in excess of the vast majority of zombie films, it looks cheaper than most. Tod Williams' direction is the very definition of uninspired, the CG effects are on a par with the Sharknado series, and the zombie (or 'phoners' as they're referred to here) extras are often laughable, resembling alternative dance troupes in their movements. King, who co-wrote the screenplay here, has always struggled with his endings (ask anyone who made it through 800 plus pages of It only to be confronted with a giant spider), and Cell's climax is bizarre and baffling, though fans of Liverpool FC may get a kick from its curious musical accompaniment. 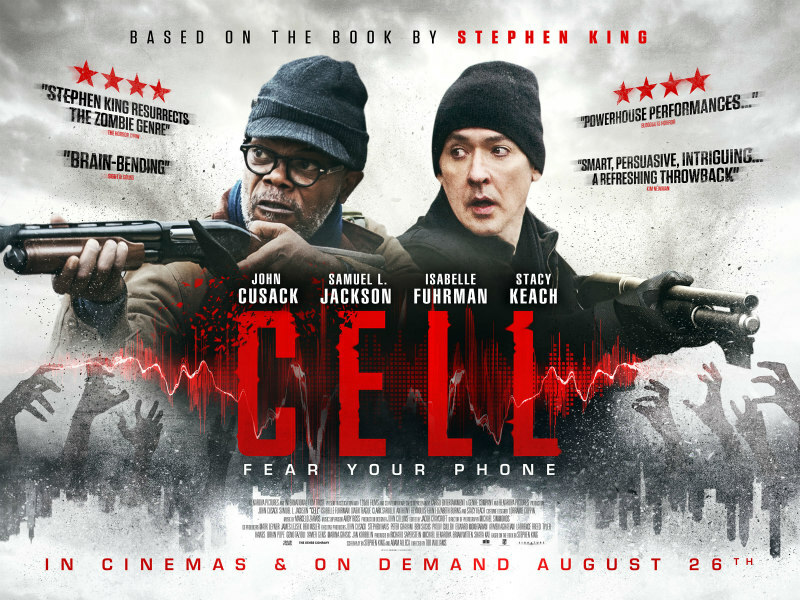 Cell is in cinemas and on VOD August 26th.